We may not have a celebrity budget, but we can look to those that do for inspiration! We all want a wedding to remember and to have our guests talking (in the best way) about our beautiful flowers. Whether your wedding décor is elegant and traditional, sleek and modern, or country rustic, the flowers are a huge part of the overall ambiance. Flowers accent your theme, dress, and venue, lending impact, color and interest to your special day. Check out the floral choices made by some recent celebrity brides for their big events. (If it’s good enough for Donald Trump, chances are your mother-in-law will approve.) Our talented consultants have selected bouquets to match each bride’s theme. This way you get gorgeous fresh wedding flowers for a celebrity look, at a very savvy price. Now that’s inspired! Popular actors Roselyn Sanchez and Eric Winter were married at Fort San Cristobal in Old San Juan, Puerto Rico. The pair welcomed approximately 250 guests at a lavish sunset ceremony. Roselyn wore Christian Louboutin pumps with a princess-style, Angel Sanchez gown embroidered with pearls and diamonds, placing white gardenias in her hair. The ceremony was followed by fireworks and an elaborate meal that included lobster and filet mignon. The fort was filled with flower arrangements, including thousands of orange, ivory and pink roses, with pink and green hydrangeas. The splashes of rich orange and coral really pop against the large white hydrangeas and provide effective contrast to the pale pink roses. Lush greenery and classic urns add to the upscale, traditional ambiance. Get the Look: Use any of the following bouquets to achieve this look on your own special day. Anne Hathaway married Adam Shulman in a romantic sunset ceremony at a private estate in Big Sur, California. Her dress was a stunning, custom-made Valentino creation of ivory silk point d’esprit tulle, with hand-painted satin flowers on the train. She wore no apparent jewelry, accessorizing by pinning a 1920s-inspired headband to a simple veil. The couple splurged on the flowers, spending an estimated $100, 000 on the budget. A soft, romantic palette of white, cream with hints of peach gives a timeless old-world feel to her gorgeous bouquet. 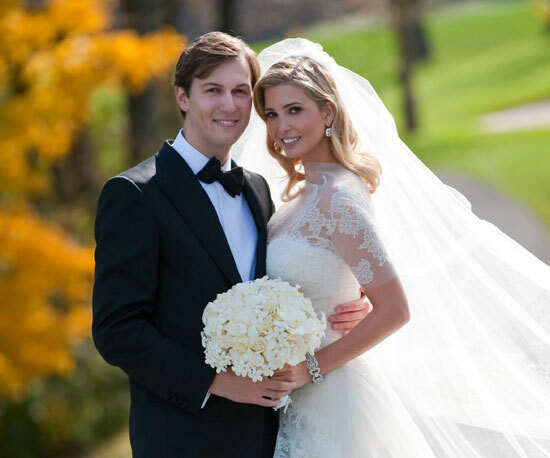 Ivanka Trump married Jared Kushner, owner of New York Observer, at Trump National Golf course in Bedminster, NJ. Her father “the Donald” was present and provided warm toasts to the happy couple. Ivanka wore an elegant Vera Wang gown inspired by Grace Kelly, with jewelry from her own collection. Her floral theme was white on white, with flowers that included lilies of the valley, hydrangea, orchids, ranunculus, roses and gardenias used throughout the venue. Her simple yet stunning bouquet includes white roses and stephanotis. Pop superstar Kelly Clarkson married talent manager Brandon Blackstock in an intimate ceremony for select friends and family. The couple married at Blackberry Farms, in Walland, Tennessee. Kelly wore a beautiful dress from Temperley Bridal with flowing lace sleeves. The farm location provided the perfect backdrop with its rustic covered bridge and green hillsides. Her bouquet was a vivid mix of sunflowers and bluebonnets (the official state flower of her native Texas) and set the perfect complement to the relaxed outdoor venue. If you want further inspiration for your own rustic-themed wedding, you can watch Kelly’s wedding video here (video courtesy of Weiss Eubank Films) : http://vimeo.com/77468517. Whatever your theme, you can find many more gorgeous flower concepts at www.bunchesdirect.com. Feel free to bring your own ideas to our professional wedding consultants, and be sure to check back here: More “Get the Look for Less” celebrity inspiration is coming soon!